Because the Earth is a small charged body moving in a large cell of plasma, explanations of all physical phenomena in, on, and near the Earth must take the electrical behavior of plasma into account. Taking this larger picture into account will add new insights for understanding details of everyday phenomena, such as the weather. Meteorologists are not sure how tornadoes form but they do know that they are often associated with severe electrical storms. The key to understanding tornadoes is that they are the result of rapidly rotating electric charge. Just as electrons are the current carriers in the copper wires we use for power transmission, so they are in the tornado. The BIG difference is that the electrons are moving at many meters per second in the tornado while they take several hours to move one meter in the copper wire! The result is that enormously powerful electromagnetic forces are in control of the tornado. This effect has been called a "charged sheath vortex." The shape of the vortex is strongly constrained to be long and thin with a circular cross-section. This true shape of the vortex is usually hidden in tornadoes because of the obscuring dust and clouds. The vortex itself will only be visible if it has sufficient electrical energy to ionize atoms in the atmosphere. That is clearly the case on the Sun. And some people who have survived the experience of being "run over" by a tornado have reported an electrical glow in the inner wall of the tornado. 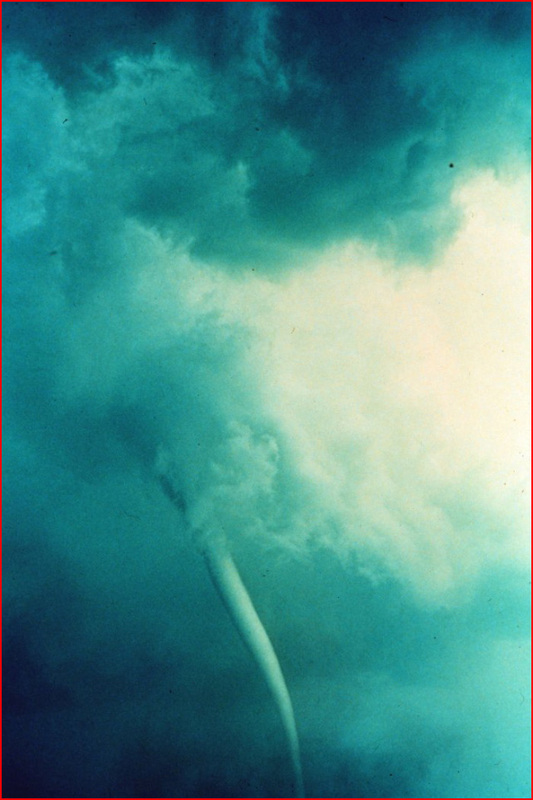 It is commonly thought that a tornado is a means for mechanical energy in the storm to be converted somehow to electrical power, which is then transmitted very effectively to ground by the electrical conduit of the charged sheath vortex inside the tornado. The "somehow" arises only because nobody visualizes the electrical dimension of the solar system. Electrical power from space is partially dissipated in the mechanical energy of the encircling winds. Instead of generating the electrical effects, the tornadic winds are driven by the charge sheath vortex and its connection to the electric currents of the solar system.